From award-winning science journalist Linda Geddes, a fascinating and practical companion for expectant parents that makes sense of conflicting advice about pregnancy, birth, and raising babies. Can I eat peanuts during pregnancy? Can men get pregnancy symptoms too? How much do babies remember? The moment she discovers she’s pregnant, every woman suddenly has a million ques­tions about the life that’s developing inside her. Linda Geddes was no different, except that as a journalist writing for New Scientist magazine she had access to the most up-to-date scientific research. What began as a personal quest to find the truth behind headlines and information that didn’t patronize or confuse is now a brilliant new book. 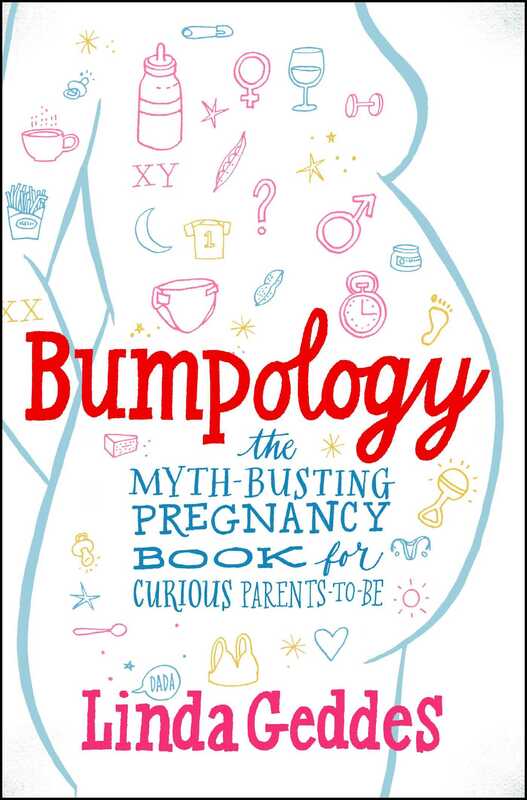 In Bumpology, Geddes discusses the latest research on every topic that expectant parents encounter, from first pregnancy symptoms to pregnancy diet, the right birth plan, and a baby’s first year. Bumpology Food and Drink . 1 . Why do pregnant women crave unhealthy food? Angelina Jolie craved chocolate with cinnamon and chile, Cate Blanchett wanted pickles and ice cream, while Britney Spears is said to have wanted to eat soil. A recent study on the pregnancy website www.babycenter.com found that about 85 percent of American women experienced at least one food craving during pregnancy. Around 40 percent craved sweet foods, while 33 percent lusted after salty snacks. Spicy foods came in third, at 17 percent, followed by fresh fruit, at 10 percent. Surprisingly few scientific studies have been carried out on food cravings during pregnancy. Those that have been find that pregnant women often have a desire for salty foods and become less sensitive to the taste, as well as becoming more sensitive to bitter tastes. The salt craving may come about because, as their blood volume expands, pregnant women need slightly more salt to maintain the balance of fluids in their bodies. An aversion to bitter flavors is less easy to explain, but some have proposed that it steers women away from poisonous plants, which are often bitter (see 3: “What causes morning sickness?”). As to why pregnant women crave sweet foods, studies of how taste preferences vary over the menstrual cycle may provide some clues. Women tend to want foods that are high in carbohydrates and fat during the second half of the menstrual cycle, when levels of the hormone progesterone are high. They are more sensitive to sweet tastes during the first half of the cycle, when levels of estrogen are higher. Although both hormones increase during pregnancy, there is relatively more progesterone than estrogen, which may explain why women long for sweet, energy-rich foods like chocolate or cake (or preferably both at the same time). A lot of people assume that you crave the foods your body needs. Although no one has studied this specifically in pregnant women, there is some evidence that it may be true. Leigh Gibson and his colleagues at the University of Roehampton, London, gave their test group two flavors of soup to try: one that was high in protein and one that was low. A few days later, the volunteers were either starved of protein or given a protein-rich drink before being offered a choice of the two soups for lunch. Those who were protein-starved said they preferred the protein-rich flavor, and they also ate far more of it. In other words, if you are starved of protein, you subconsciously begin to prefer the taste of foods that contain large amounts of it. “It seems we can rapidly learn to want to eat foods that supply needed nutrients like protein,” says Gibson. Likewise, cravings for sweet, fatty foods may reflect a need for energy, although Gibson cautions that they could also reflect a need for emotional comfort, as we often get a lot of pleasure from eating them. So if your body is screaming out for ice cream, perhaps it’s worth considering how much you’ve already eaten that day before concluding that your baby is deficient in chocolate-chip cookie dough.
. 2 . Do pregnant women really eat coal? “Have you been eating coal?” was the first thing my dad asked me upon learning I was pregnant. Strange as it sounds, some women develop a taste for minerals, metallic objects, and even soil during pregnancy, a phenomenon known as pica. Some have proposed that it’s a sign of iron deficiency—though how much iron you’d get from a mouthful of coal is questionable. A survey of 2,231 British women found that 31 percent claimed to have experienced unusual cravings during pregnancy. At the top of the list was ice, followed by coal, toothpaste, sponges, mud, chalk, laundry soap, matches, and rubber. One of my neighbors even reported a penchant for cigarette ash during her pregnancy. Many of these phenomena have their own names. Pagophagia, or ice-eating, is common among American women as well: A separate survey found that 18 percent of women in the state of Georgia did it, the amount they ate ranging from a couple of glasses of ice cubes to several pounds a day. Earth-eating, or geophagia, is particularly common in African countries such as Tanzania, where up to 60 percent of pregnant women indulge. Clay-rich soil seems particularly desirable, although pottery is sometimes eaten instead. Scientists have proposed various explanations for pica, including cultural trends, stress relief (like biting one’s fingernails), and hunger. Some women who have been interviewed about their pica say that it helps to relieve heartburn and nausea, and often the items they choose have an alkaline pH, which may help to neutralize stomach acid. Most women, though, have no idea why they crave such oddities. A common scientific explanation is that these women are deficient in certain nutrients, such as iron, zinc, or calcium. Although there have been hundreds of reports of iron-deficient women craving soil and other pica, when researchers have analyzed how much iron is released from the digestion of soil or clay, the answer is: very little. Neither does giving women iron supplements to cure their anemia stop their cravings. What’s more, eating clay and soil can actually inhibit the uptake of iron and other minerals by the gut. But just because soil doesn’t cure anemia doesn’t mean that anemia doesn’t trigger the craving. “It may be that being deficient in essential minerals induces a craving for anything mineral-tasting,” says Gibson. An intriguing suggestion is that eating clay reduces the chances of food poisoning. Several studies have shown that certain substances in soil can bind to bacteria, viruses, and toxins in the gut, preventing them from being absorbed into the bloodstream. Some types of clay also seem to increase the secretion of mucus in the intestines, making it harder for bacteria to get through. Why women crave ice remains a mystery. Some have suggested that it has the same crunchy texture as dry clay or soil, so eating it has a similar psychological effect. Others propose that it calms tongue pain or swelling, which is a common symptom of iron deficiency.
. 3 . What causes morning sickness? I write this in the throes of morning sickness, seven weeks pregnant and curled up in bed with a hot-water bottle, praying for the current wave of nausea to pass. This is my second pregnancy, and I’m sure it’s worse this time (for one thing, I’m actually vomiting, rather than just feeling queasy). Up to 80 percent of women experience some degree of morning sickness during pregnancy. Generally, it is at its worst between weeks four and ten, and even the unlucky few who continue to feel sick after ten weeks are usually free of it by week twenty. There are several theories about why morning sickness should exist. One is that it evolved to steer pregnant women away from eating plants containing toxins that might harm the baby (it’s also why pregnant women are thought to develop an aversion to bitter foods; see 1: “Why do pregnant women crave unhealthy food?”). But in that case, you’d expect women to feel sicker after they’d eaten fruit or vegetables, and there’s little evidence to support this, although I did develop a weird aversion to lettuce in my first pregnancy. The theory is also dealt a minor blow by the fact that India (where many people are vegetarian) has the lowest rate of morning sickness, with just 35 percent of women suffering from it. Japan has the highest rate, with 84 percent of pregnant women experiencing nausea and vomiting. A related theory is that morning sickness evolved to protect the embryo from bacteria or parasites in the diet that could harm it. Paul Sherman and Samuel Flaxman at Cornell University put forward this theory after reviewing studies involving nearly eighty thousand pregnant women from around the world. Pregnant women are particularly susceptible to food poisoning because their immune systems are suppressed, and serious illness can increase the risk of stillbirth or miscarriage (one reason why we’re told to avoid soft cheeses). Cells in the embryo are also dividing rapidly, leaving them more susceptible to any damage to DNA caused by harmful toxins. Sherman and Flaxman note that the level of nausea and vomiting usually peaks at the same time the baby’s vital organs are forming, and a baby is also growing very quickly at this point, so if its DNA is damaged, that could have disastrous effects. Commonly avoided foods include meat, fish, poultry, and eggs (foods that are the most likely to contain dangerous microorganisms), as well as caffeinated drinks like tea or coffee, which could harm the baby if consumed in large amounts. It’s true that morning sickness is less common in societies that consume only small amounts of meat and fish and eat more plants as staple foods, including some American Indian and First Nations tribes. Women experiencing morning sickness may also be marginally less likely to miscarry. One large study found that 90 percent of women with no morning sickness gave birth to a live baby, compared to 96 percent of women who did experience morning sickness. Perhaps more convincingly, morning sickness may simply be an unfortunate side effect of the same hormone that confirmed you were pregnant in the first place. Human chorionic gonadotropin (HCG), the hormone detected by pregnancy tests, is produced by the embryo during the early weeks of pregnancy in order to maintain a structure called the corpus luteum, which produces other pregnancy hormones needed to keep the lining of the uterus nice and thick until the placenta is big enough to take over. But HCG has other effects on the body, such as stimulating the thyroid gland in the neck. This gland produces several hormones that regulate metabolism, and high levels of thyroid hormones seem to be associated with particularly severe vomiting in women with morning sickness. Two other pregnancy hormones, progesterone and estrogen, may also contribute to general feelings of queasiness, bloating, and heartburn, as they slow down the digestive system, so food takes longer to travel through your gut. Rampaging progesterone may explain another annoying side effect of early pregnancy: extreme tiredness. At very high doses, progesterone can be used as an anesthetic, having a similar effect on the brain to barbiturates. No one has shown conclusively that women with higher levels of these hormones are more prone to morning sickness; it’s just a theory. Neither do we know why some babies seem to cause more sickness than others—although the placentas of female fetuses do seem to produce more HCG than those of male fetuses (presumably because hormone production is linked to the X chromosome). Just three weeks into pregnancy, HCG levels are nearly a fifth higher in women carrying female embryos than those carrying males. There is also some evidence that women with particularly severe morning sickness are marginally more likely to be carrying girls or twins.
. 4 . Is there anything I can do to reduce morning sickness? Perhaps, although the evidence isn’t very strong. Both the American College of Obstetrics and Gynecology (ACOG) and the UK’s National Institute for Health and Clinical Excellence (NICE), which offers evidence-based guidance to doctors, suggest that ginger may help to relieve nausea and vomiting. ACOG also recommends vitamin B6, or vitamin B6 plus an antihistamine called doxylamine. However, the Cochrane Collaboration recently reviewed the evidence for morning-sickness treatments, including acupuncture, acupressure, vitamin B6, ginger, and some anti-sickness drugs, and found little consistent or reliable evidence to support any of them. You may just have to ride out the sickness and look forward to the later stages of pregnancy, when you’ll be carrying a proud bump and should be able to feel your baby moving about inside you.
. 5 . How much alcohol is it safe to drink during pregnancy? I’m sure I’m not alone in feeling confused and a little irritated by the messages women are given about alcohol consumption during pregnancy. A recent discussion on the UK Internet forum Mumsnet about whether someone could indulge in a few glasses of wine at a wedding generated sixty-nine responses—with angry arguments on both sides. A withering list of countries—including the U.S., UK, France, Canada, Australia, New Zealand, Ireland, the Netherlands, and Spain—currently advise pregnant women to abstain completely from alcohol during pregnancy (although the UK government concedes that if you do decide to drink, you should “consume no more than one to two units, or 10–20 milliliters, once or twice a week”). The U.S. advises women who are even thinking about getting pregnant to abstain. Yet until quite recently, pregnant women were told to drink half a pint of Guinness or stout each night to keep their iron levels up. We all know of women who have drunk moderate amounts of alcohol during pregnancy—or who have been blind drunk before realizing they were pregnant—and their babies appear to have turned out fine. So what is a safe amount of alcohol to drink? When researchers at the UK’s National Perinatal Epidemiology Unit in Oxford reviewed forty-six scientific papers looking at the effects of low to moderate drinking during pregnancy, they found no increased risk of miscarriage, stillbirth, premature birth, low birth weight, or birth defects (including fetal alcohol syndrome). These women were drinking a fair amount of alcohol each week—up to 10.4 units per week, or about five small glasses of wine. However, the researchers also found plenty of flaws in the studies, which meant they couldn’t say conclusively that light to moderate drinking is safe. The truth is that no one really knows what constitutes a “safe” amount of alcohol. It’s clear that large amounts can cause fetal alcohol syndrome (FAS), a serious condition that stunts the physical and mental development of the child. According to a report by the UK’s Royal College of Obstetricians and Gynaecologists, drinking more than six units a day puts babies at risk of FAS and can also trigger miscarriage. Birth defects are three times more common in the babies of women who drink more than four and a half units a day, compared to light drinkers and abstainers—but birth defects are still pretty rare. Meanwhile, 45 percent of women who drink more than two units (a small glass of wine) a day during their third trimester may have a baby with low birth weight, which can increase the risk of developmental or behavioral problems later in life—although the evidence for this is mixed. However, below this level there’s a big gray zone in which there may or may not be an effect. In 2012, a large Danish study concluded that one to eight drinks a week seemed to have had no effect on children’s IQ or attention span, or on brain functions such as planning, organization, and self-control by the time they reached the age of five. Unlike many studies, this one was well designed, in that it asked women how much alcohol they were drinking when they were actually pregnant, then followed the progress of their children as they grew older. It’s also not correct to assume that abstinence is the best policy: Several studies have suggested that children born to mothers who drank one to two units of alcohol per week in their pregnancy were less likely to have behavioral problems than those born to abstainers. In one such study, the sons of light drinkers had fewer behavioral troubles and less hyperactivity, and the daughters had fewer peer problems and emotional difficulties. Children of moderate drinkers, who consumed three to six units per week, were broadly similar to those of women who drank nothing, while there were slightly more behavioral problems in the children of women who drank more than seven units a week. However, it’s also possible that these differences arose because light drinkers were more relaxed, or came from higher-income or more educated backgrounds than abstainers. Patrick O’Brien of the RCOG says that light drinking—one to two units once or twice a week—is extremely unlikely to harm your baby. Vivian Nathanson of the British Medical Association (which advocates abstinence) admits that up to eight units is unlikely to cause harm, but suggests it is far better to err on the side of caution and drink nothing or very little. It’s also likely that babies are more vulnerable to the effects of alcohol at some periods of their development than at others. One recent study found that drinking more than one alcoholic drink per day during pregnancy generally increased the risk of babies being underweight or shorter in length at birth, but consuming alcohol between weeks seven and twelve was strongly linked with the characteristic deformities associated with fetal alcohol syndrome: small head, small upper jaw, thin upper lip, and small, narrow eyes. Women who had just a couple of sips of alcohol were classified as nondrinkers, however. Weeks seven to twelve of pregnancy are particularly busy in terms of development: In just five weeks, the baby goes from looking like a mutant tadpole to looking like a human being, while after week twelve, its main task is to get bigger. So perhaps it’s no surprise that this would be a particularly critical time to avoid anything that might perturb that development. It’s also probably the time when women are least likely to want to drink, as morning sickness is at its peak and most women will be feeling dog-tired. Ultimately, every woman needs to decide for herself whether she believes the occasional drink during pregnancy is okay. Based on the evidence I’ve seen, I’ve developed my own set of rules. • The first trimester is when the baby is most at risk, so try to avoid drinking then. If you didn’t realize you were pregnant, just stop drinking now. Most women realize they are pregnant by seven weeks, which is when the most critical point seems to start. • If abstinence isn’t for you, try to stick to one to two units once or twice a week. However, if you occasionally drink more than this (up to about eight units a week), it’s probably fine. • Know how much a unit of alcohol is, and remember that some wines and beers are stronger than others. • Binge drinking is likely to be worse than drinking the same amount over a long period because it exposes your baby to higher concentrations of alcohol. So try to spread your drinks out as much as possible.
. 6 . Can unborn babies taste what Mom is eating? Unborn babies are floating in a veritable cocktail of taste sensations, which may be teaching them what’s good to eat in preparation for when they pop out into the big wide world. Taste buds on the tongue begin to develop just thirteen to fifteen weeks into pregnancy, enabling babies to detect simple tastes such as sweet, sour, and salty, but many of the more complex flavors we experience are the result of volatile molecules from foods like garlic passing over smell receptors in the nose. All of these things can find their way into the amniotic fluid that surrounds the baby, in much the same way that flavors get into breast milk (see 111: “Does what I eat change the flavor of my milk?”). “If it gets into the blood supply, it will get into the amniotic fluid and the breast milk,” says Julie Mennella at the Monell Chemical Senses Center in Philadelphia, who spends her days trying to understand how preferences for certain flavors develop. During the third trimester of pregnancy, fetuses breathe and swallow around a liter of amniotic fluid a day—probably as practice for when they’re born, rather than for any nutrients—and much of this fluid will pass smell and taste receptors in the nose and mouth. Some smelly molecules, such as the sulfurous compounds that give garlic its characteristic smell and taste, are so potent that if you take a sample of amniotic fluid from a woman who has eaten a garlicky meal, you can smell the garlic wafting from it. So unborn babies do get a taste of what their moms are eating during pregnancy, and they also seem to remember it. Several studies have shown that babies whose mothers ate a lot of garlic or aniseed during pregnancy are attracted to those smells in the first days after birth, making rooting or sucking motions when they catch their scent.
. 7 . Can Mom’s food fads influence her baby’s palate? Not only are babies treated to a banquet of flavors before birth, it seems the memory of these tastes may influence the kinds of foods they like in later life. Trying to eat as many different flavors as possible during pregnancy and breast-feeding should therefore expose your baby to a smorgasbord of different tastes, and in theory, this may make them less prone to fussy eating. However, it could also set a bad example if you choose to indulge in less wholesome options. Babies whose mothers drank two small glasses of wine a week during pregnancy showed more smiling, suckling, and licking expressions in response to the smell of alcohol than those whose moms drank very little or nothing at all. It’s not clear whether this penchant for alcohol lasted into adulthood, though a bizarre study on rats suggests it might. Adolescent rats whose mothers had consumed alcohol during pregnancy showed a greater interest in drunken partners than those whose mothers hadn’t consumed alcohol—presumably because they could smell the alcohol on their breath. It gets even weirder. Several studies have found that children’s propensity for salt can be influenced by the degree of morning sickness their mothers experienced. Sixteen-week-old babies whose mothers endured moderate to severe vomiting during the first fourteen weeks of pregnancy were more tolerant of salty drinks than those whose mothers experienced no morning sickness. One possible explanation is that throwing up can dehydrate women, making their amniotic fluid more concentrated and salty.
. 8 . Is coffee bad for my baby? If you’re someone who simply can’t function without the morning latte or espresso, the great news is you don’t have to stop. Although a handful of studies have linked the consumption of caffeine to reduced birth weight and an increased risk of preterm birth or stillbirth, other studies have found no effect. The Cochrane Collaboration tries to make sense of these kinds of contradictory studies by taking a bunch of them and systematically weighing the evidence to help people make informed decisions about their health. It recently weighed in on the issue of caffeine during pregnancy and concluded that drinking three cups of instant caffeinated coffee a day during early pregnancy probably has no effect, so there is no reason to avoid it in small amounts. Drinking a lot more than three cups of coffee a day may be more of a problem, however. One large study found that women who drank more than 550 milligrams of caffeine a day (roughly equivalent to six regular cups of coffee, or twelve cups of tea or green tea) had slightly shorter babies. If you do decide to drink coffee, one thing to watch for is that different blends vary in the amount of caffeine they contain. In the U.S. and the UK, pregnant women are advised to limit themselves to 200 milligrams of caffeine a day—somewhere between two and four cups of coffee, depending on whose data you use. But a recent survey of espressos bought in Scotland found a sixfold variation in the amount of caffeine they contained, with one espresso bought in Glasgow’s West End containing 322 milligrams. A Starbucks espresso, by contrast, contained just 51 milligrams. Since lattes and cappuccinos are often made by diluting a double shot of espresso, you might want to ask your barista to hold the second shot.
. 9 . Can I eat peanuts during pregnancy? The official advice on this waxes and wanes, but currently, both the American Academy of Pediatrics (AAP) and the UK Food Standards Agency say that it’s fine to eat peanuts during pregnancy (even though both previously advised against it if there was a history of allergy or asthma in the child’s immediate family). Certainly, several studies have suggested an indirect link between eating peanuts during pregnancy and childhood allergy. For example, in 2010, many newspapers seized upon an American study that found that children were more likely to test positive for antibodies against peanuts if their mothers had eaten peanut products during pregnancy (an indirect marker for possible peanut allergy). However, even the study’s authors urged caution in interpreting its results. For one thing, they relied on mothers’ memories of how many peanuts they had eaten, rather than measuring quantities themselves. They also tested only children who already had suspected allergies to milk or eggs rather than the general population, and they didn’t test for peanut allergy directly. What’s more, several studies have found the opposite: that eating peanuts during pregnancy may protect infants against allergies. In such situations, the most sensible thing to do is to weigh the results of as many studies as possible to decide where the best evidence lies. Fortunately, someone has done this for us: In 2008, the American Academy of Pediatrics reviewed the available studies and concluded that there currently isn’t enough evidence to support the idea that avoiding peanuts—or other foods—during pregnancy will reduce your child’s risk of allergies. A recent review by the UK’s Committee on Toxicology reached a similar conclusion. This doesn’t necessarily mean peanuts have the all-clear; just that more good-quality research is needed to decide either way. Until then, you may as well carry on eating peanut butter—spread it on pickles, if you’d like.
. 10 . Should pregnant women really eat for two? There’s no doubt that being pregnant is hungry work, and no, you’re not just being greedy: The hormone progesterone, which soars during pregnancy, is known to boost the appetite. But although it can be tempting to help yourself to a second slice of cake because you’re “eating for two,” there are good reasons not to overindulge—at least not every day. The good news is that if you can’t resist, it is generally safe to exercise during pregnancy (see 22: “Is it safe to exercise during pregnancy?”). In 2009, the U.S. Institute of Medicine issued guidelines saying that women should gain no more than 25 to 35 pounds during pregnancy, while those who are already overweight should gain no more than 15 to 25 pounds, and obese women no more than 11 to 20 pounds. That’s all very well, but around half of women gain more weight than this, and although a little extra weight is unlikely to harm you or your baby, putting on a lot of extra weight can increase your risk of gestational diabetes, high blood pressure, and needing a C-section or mechanical help (like forceps) to get the baby out. Another good reason not to overindulge is that women who put on a lot of extra weight during pregnancy find it harder to shift it afterward—and I speak from bitter experience. A recent review of nine studies found that women who gained more than the recommended amount of weight carried an average extra 3.06 kilograms (6.75 pounds) three years after giving birth and an extra 4.72 kilograms (10.4 pounds) after fifteen years. Putting on too much weight too quickly may also increase your chances of having hemorrhoids, varicose veins, and stretch marks. So how many extra calories does your body need to grow a baby? Most doctors recommend eating just 100 to 300 extra calories a day during pregnancy, which doesn’t add up to even a slice of cake. As a rough guide, you should expect to put on 2 to 4 pounds in total during the first twelve weeks, then 1 to 2 pounds a week after that.
. 11 . How dangerous is it to eat Camembert and blue cheese? Why is it that, when you’re pregnant, beautiful creamy soft cheese is everywhere? And yet we can’t eat it—we’re told—because soft and blue-veined varieties of cheese carry a risk of listeriosis, a type of food poisoning that can trigger birth defects and miscarriage. Listeriosis is caused by a bacterium called Listeria monocytogenes, which is present in soil and therefore gets on the grass eaten by the cows, sheep, and goats that produce the milk for cheese-making. These bacteria are usually destroyed by heating or pasteurization, but if they do survive, they find it easier to grow in ripened soft and blue-veined cheeses, which are often less acidic and contain more moisture than hard cheeses. Although people can come into contact with listeria without getting listeriosis, pregnant women are twenty times more likely to develop it than nonpregnant women of the same age because their immune systems are weakened. Even so, cases of listeriosis are pretty rare. According to the Centers for Disease Control and Prevention (CDC), there are around 1,600 cases in the U.S. a year (resulting in around 500 deaths), and only around 17 percent of these cases are in pregnant women. People over the age of sixty are also at increased risk, as are people with cancer or any other disease that suppresses the immune system. That said, the consequences of listeria infection during pregnancy are pretty terrifying. Around one in 25,000 pregnant women contracts listeriosis, and besides making the woman feel rotten, the infection can cause complications and trigger miscarriage in around 20 percent of cases. Unfortunately, we can’t say how many cases of listeriosis there would be if pregnant women decided to ignore the standard advice and scoff artisan cheeses at will. But cheese isn’t the only source of listeria infection—prepacked sandwiches, ready-to-eat meats such as hot dogs, sliced meat and pâté, butter, and smoked salmon can also carry the bug, so if you’re worried about listeria, you should probably avoid these as well. A recent analysis of the likely sources of listeria infection in the U.S. found that melons and hummus were prime suspects, as was living on a cattle farm, while a review of recent UK cases found that foods such as prepacked sandwiches or ready-to-eat salads topped the list of likely sources of infection. The good news is that thoroughly cooking risky foods should kill the bacteria that cause listeriosis—as long as you ensure that the food is piping hot before serving. There are mixed messages about whether soft cheese made from pasteurized milk is safe. The CDC says it is, while the UK’s NHS cautions against eating soft cheese, regardless of whether it says it has been pasteurized. Pasteurization will kill any bugs that were living in the milk before it was treated, so that should reduce the risk, but there is still a chance that cheese could become contaminated during packaging. Linda Geddes is a London-based magazine journalist who writes about biology, medicine, and technology. She has worked as both a news editor and reporter for New Scientist magazine. She has received numerous awards for her journalism, including the Association of British Science Writers’ award for Best Investigative Journalism and the European School of Oncology’s Best Cancer Reporter. She was also shortlisted for the Paul Foot Award in 2011 and the Press and Periodicals Association’s Writer of the Year award in 2009, 2011 and 2012. Are Cloth Diapers Really Greener Than Disposable?